With a successful track record spanning three decades in Singapore, DiS specialise in Industry 4.0 integrated manufacturing and Q.M.S productivity software for the discrete manufacturing sector. The manufacturing shop-floor is the beating heart of any discrete manufacturing business, and its ability to produce the highest quality products at the lowest possible cost and in the shortest possible leadtime, is key to the company’s success, profitability and growth. boost Productivity, Utlisation, Efficiency, Throughput and Profit ?, if so then your focus should clearly be on manufacturing software that optimizes your production operations instead of software for the accounting & administrative departments !. Many businesses invest in expensive, big-name E.R.P software expecting it to integrate every department, only to later find that it is only suitable for, and mainly used by the Accounting Department. Often, due to the simplistic, inflexible manufacturing functionality, the Engineering, Planning, Production and Quality departments are unable to use the manufacturing software and revert instead, to using the same Excel spreadsheets they used before the ERP software was installed. This is because ERP Manufacturing Software solutions often try to 'be a jack of all trades', take months to implement, and are generically designed to try and fit a wide range of business types such as trading, warehousing, retail, distribution and service sectors, resulting in a lack of industry focus and comprimised functionality. In many high mix, low volume manufacturers, as soon as a workorder job is released into production, it disappears into a manufacturing Black-Hole. From there on, there is very poor visibility of job progress or status, and little or no feedback received until it finally emerges as a finished item. And when a customer calls enquiring about the status of their order, often the only solution is to jalan-jalan down to the production shop-floor, try to physically locate the job, and speak to the person who is working on it. Quickly and efficiently create, monitor and manage new and repeat workorder jobs and their associated processes, resource and material requirements. Automatically schedule workorders, material requirements and machine loading based on customer want date, priority and available resource capacity. Record your production operator's activities and WIP movement in real-time directly from the manufacturing shopfloor using rugged, barcode-enabled touch screen kiosks. Become more proactive and continuously improve by utilising real-time feedback provided from job definitions, production plans and real-time shopfloor execution. Optimised for discrete High-Mix, Low-Volume; Jobshop; Manufacturing; Engineering and Service or Repair industries, PURE Manufacturing is a Industry 4.0 Manufacturing Execution System (M.E.S) designed not by software programmers, but by manufacturing professionals with decades of practical experience. PURE Manufacturing includes modules to Define, Plan, Track, Manage, Analyse and Report on the entire manufacturing process life cycle, providing live visibility and control over your manufacturing operations. Desktop computers are generlly unsuitable for the harsh manufacturing shopfloor, so we have two design approaches for the user interfaces in PURE Manufacturing: desktop PC browser-enabled applications that are used by Managers, Engineers and Planners in the back-office, and interractive, barcode-enabled Rugged Touch Screen Kiosks used by operators on the production shopfloor. 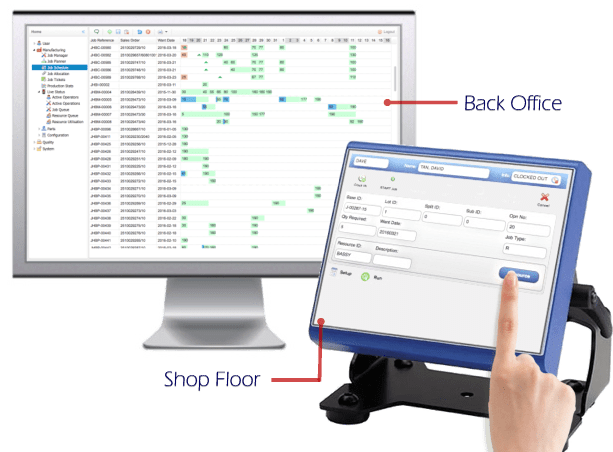 Real-Time information captured directly from shopfloor operators is used to update & track the progress and status of every job as it progresses through each of its manufacturing processes either by human operators, or through I.O.T Embedded devices.. Implement Industry 4.0 in your manufacturing workplace. Quickly visualise the progress and flow of each workorder. Improve productivity, efficiency and machine utilisation. Reduce queue times, lead times, costs and duplicated data entry. Be automaticaly alerted to exceptions. Accurately quote new jobs based on historical data. Eliminate your manufacturing black hole. Become less reactive and more proactive. Spend less time fire-fighting and more time manufacturing. An open-loop production planning system such as those used by most traditional E.R.P manufacturing software, is outdated immediately new orders are added, a customer order changes, or any work is performed on the processes, because they lack feedback with what is actually happening. A closed-loop feedback system that enables real-time, accurate measurement of the actual progress against the planned is therefore essential in optimising any process, project or activity. The effects of any adjustments or productivity improvements are then easily seen and measured, and the ability to learn from this historical data helps to effectively plan any future work. Pure Manufacturing software is so easy to understand, easy to implement and easy to use, you can have personnel adapted to it and fully using the system in just a few days, even if they have no previous experience with computerised manufacturing systems. It will quickly help maximise your Efficiency, Machine Utilisation, Productivity and Throughput, enable you to embrace Industry 4.0, Lean Manufacturing and Continuous Improvement methodologies, and provide your business with a competitive edge that spends less time fire-fighting and more time manufacturing. Due to an intuitive interface design and clear industry focus, full implementation can often be achieved in a matter of days (instead of months as is the case with many solutions), allowing you to quickly see measurable results and experience a fast return on your investment. Our Manufacturing Software is designed and developed in Singapore using cutting edge platforms, frameworks and technologies.